What is it with below zero temperatures outside and ice cream? It's currently hovering around minus one outside (wind chill of minus twenty) and I'm enjoying a frosty cold bowl of chocolate fudge brownie...Even Q is begging for a lick. Murph did his "too cold outside to pee" routine - like he has other options. Murphy is working really well and consistantly. He had a weekend of pretty intense agility work and got a break from obedience. We had our last "schooling" session today (we never train Weds/Thurs/Fri if we're showing on Sat/Sun) - just a little bit of heel/attention work at the show site on Friday afternoon - keeps him fresh and ready to work. Our stay work (knock on wood) seems to be consistantly good and we haven't battled in a while. A leg would put us a long way forward towards our 2007 goals - not that I'd ever take a leg for granted - just that if we managed to get one it'd be a VERY good way to start the year. We're tired. I'm on call this week and it's been a beast of a week so far - and it's only Tuesday. The seminar was great, but Murphy is still coming off a cookie high and snapping back from overload. It's a lot of travel for one 7 minute obedience run. We don't have titles on the line. We're nearly last in our class to go - so we'd show around 3 - THEN have to hit the road. That could be a VERY long day if things don't go well. Pickup - this will come in handy for obedience as well...present a finger - dog touches it - then add movement. Dog moves towards finger every time it's presented - work both sides. This went really quickly. 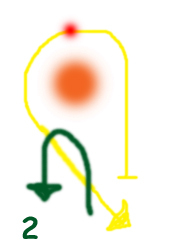 1) Figure one: Orange dot is a cone. 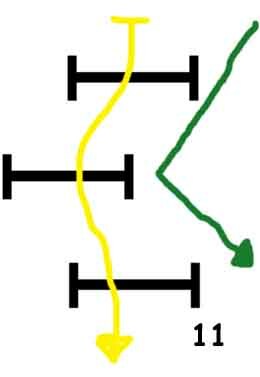 Yellow is dog's path, green is handler. 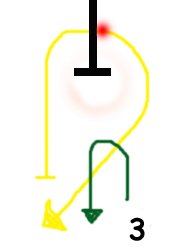 Send/shape/lure dog around cone clockwise - starting with dog on your left. Click when dog reaches the red dot, deliver treat with right hand. 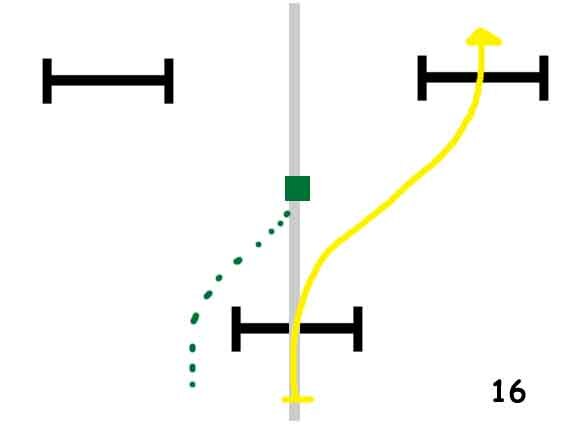 3)Replace cone with a jump - low is fine - Murph who usually jumps 24" was jumping 8" for this exercise - the thing here is for the dog to pick the most efficient path - dogs can't turn in the air, they turn when they land. 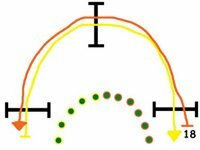 Turning when they hit the ground causes a lot of undue stress on the shoulders...Dog on your left, send/lure/shape the dog over the jump, click when the front legs hit the ground. Reward with the right hand..
5) This exercise is similar to the ones above - only now you've got three jumps involved...Temptation for the dog is to get into the series and continue straight through. Send/lure your dog through. 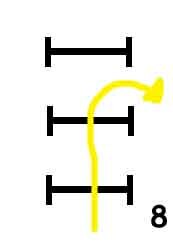 This figure shows the dog starting on handler's right. 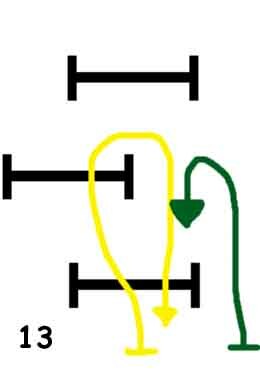 The handler moves clockwise, facing the dog and the shoulders pull the dog off the last jump and use the pickup, then click treat. 6) The jumps are still really low at this point - 8"-12" - small. They are about 4' apart. 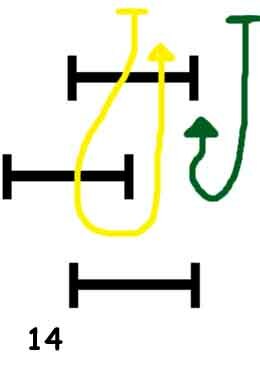 Now the handler sends the dog from their left and turns counter clockwise to pull the dog off the last jump. Once you figure out the kinesthetics it's really not so bad - plus the dogs were all very forgiving. OK, so the key here is to start using body motion not words. I got busted a couple of times for using Murphy's name in the series as the callout - I think that's my obedience nature coming out - preface the command with the dog's name. 7) Now put the dog in a wait (or not), dog on your right. 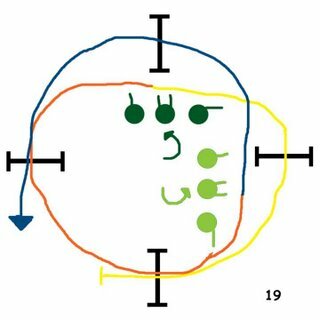 Run down the first two, turning your body towards them to pull off the third. 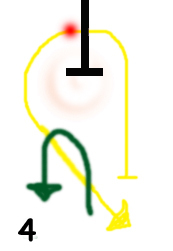 Click for the dog leaving the path to come to you...remember to use a pickup..
8) Same as 7 - going the opposite direction. Dog on left, handler moves counter clockwise for the pickup. 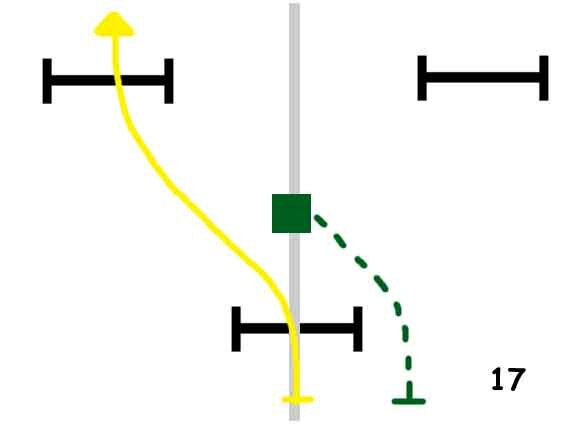 9) This exercise is the same as 7 - but you've got to be faster as you're sending and turning in one motion. Turn too quickly and you'll pull the dog off the first jump - turn slowly and he's already cleared the 2nd (or 3rd) jump. 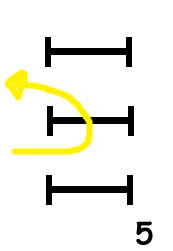 10) Same as 8 - but sorta the same as 9. If you're smart enough to have found your way this deep into my blog you'll have no problem with 10. 12) Now run the same thing the other way - dog on left, push and pull. 13) Now let's complicate things a little. 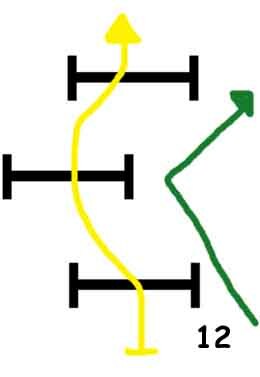 Dog's path in yellow (of course because we're talking about yellow dogs), handler in green (for no particular reason). 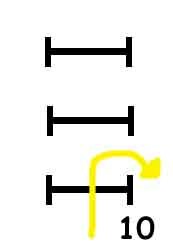 The click is a bit different here - click when the dog diverges from the path after the second jump - after dog is committed to jump two, turn towards the dog with the right hand pickup - click/treat and then send back over the first jump. 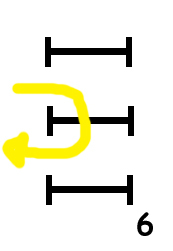 14) Again the same thing here - dog is now on your right, turn into the dog click the turn and send. 15) OUT! Two excercises in figure 15. The grey line marks the centerline. 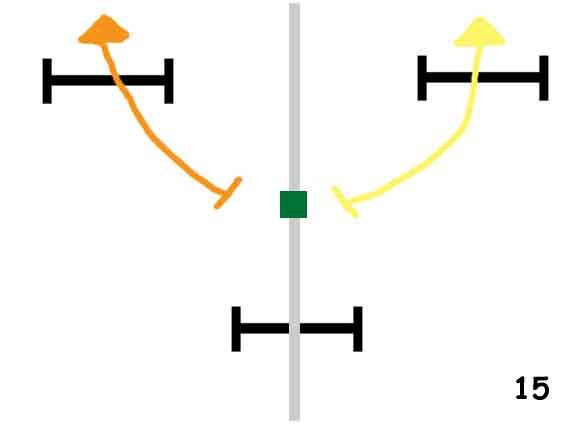 The green square is the stationary handler. 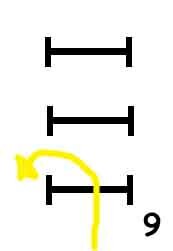 Yellow line is the dog's path: Dog on right, handler pushes hand out and to the right - sending dog over right hand jump - saying "out" when making the gesture. 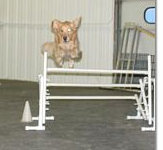 If dog is unsuccessful, make it really really easy for the dog to succeed, move to the jump and do an "over" as a send and then go back to the centerline. Julie pointed out that when things go wrong we tend to make things progressively easier - setting the dog up to need progressively easier cues. Skip the progression, make it totally easy for the dog and then go back to the harder. Orange line is the dog on the left, same cues - handler's left hand pushes out and over. 16) Here you need a wait. 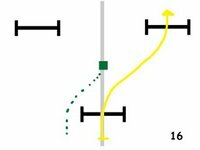 Put dog on startline, move out to the centerline, call dog over the first jump and send out to the second jump - again clicking when the dog commits to taking the jump. 17) Opposite side now. Dog on a wait, handler moves to centerline - body facing forward, calls dog over first jump - sends out to left hand jump. 18) An extension of the OUTs. 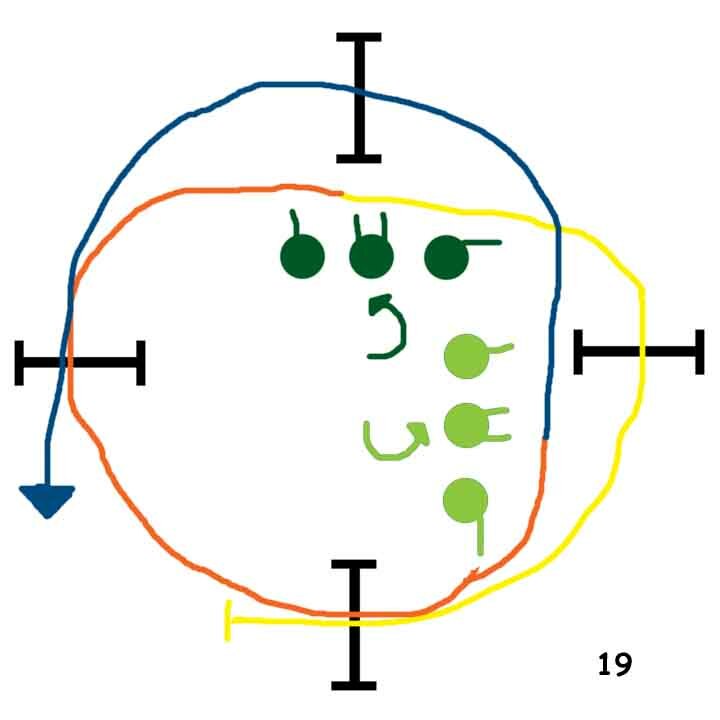 Dog on left (yellow); dog on right (orange). 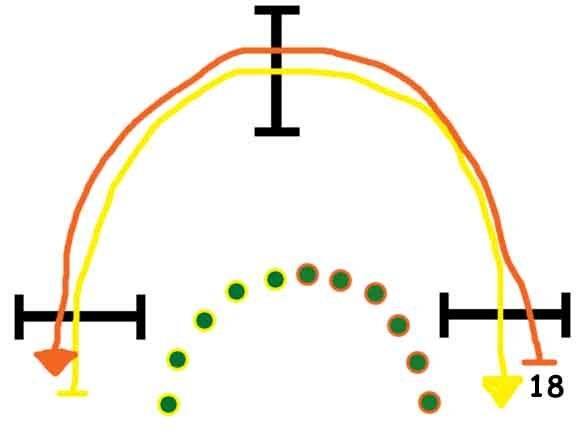 Gradually move the middle jump out further and further as the dog better understands OUT and working away from handler....Handler's path in yellow/green and orange/green dots. After a long day yesterday (therapy visit in the morning, the driving, the delivery and then more driving) I did indulge a bit and slept late - later than I'd normally let myself. Ah well, up and at 'em. Murph put down a couple of nice courses considering that he doesn't get nearly enough time practicing. Honestly, he should be running 3-4 times a week - he's lucky to get 1 or 2...though we do get our weave reps in every night. He is getting a lot of obedience though - which is good I suppose. Who would have thought that I'd have the obedience jumps up and using them (with good footing) in January. So we'll keep plugging with the time and daylight we've got - at least when baby comes we'll have even more daylight. Ahhhh, baby - smell the puppy breath. The puppies are here - the puppies are here. Thank god almighty the puppies are here. I for one alternated between being so overjoyed that the babies were going to happen/on their way - and not wanting to get my hopes up in case something happened - and things always happen - we were so sure that Emmie was pregnant back in May and that turned out not to be the case. Well, now through the miracles of modern science (surgical AI, ultrasound, x-ray and caesarian section) there are six little bundles of golden retriever currently sucking on Emmie for all they're worth. 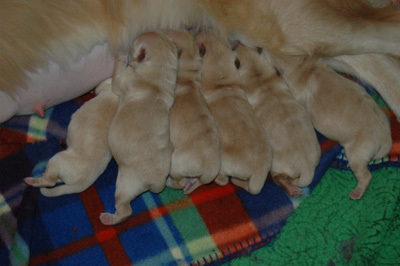 Yesterday's proceedure was smooth - all six came out and were pretty quick to not only breath but get up and howl. The half dozen were motoring around the incubator in a matter of minutes and figured out where the buffet was as soon as it was offered to them. One boy in particular has such a howl he made his feelings known that dinner was late and that was not acceptable - he put on a similar protest when the vet tied off his cord and I'm told he protests to Mom knocking him over whilst she cleans him. It's a rough life for puppy. We called him screamer - let's hope he grows out of it. 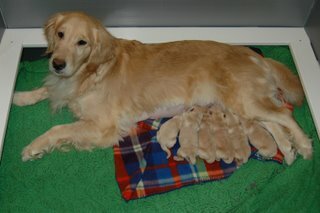 Emmie is doing well and I hear she's an excellent mom (did we expect anything less). I've broken the news to Murphy - I'm not sure it's sunken in yet. Let's hope that the puppy chases cats - Q could use to be knocked down a peg or two - if the puppy and Q gain up on Murphy we're going to have problems. I just received word that my old friend Barry died yesterday. Barry was nearly 17 hands of horse, a mahogany bay with 2 short white socks, a big roman nose with the biggest softest brown eyes and a white star - which as he aged became slightly longer each year. Barry was very much the dog of my teen years, we learned so much together - from collected canter and extended trot and some FEI movements - Man! 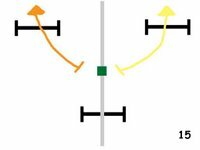 The flying changes that horse could do! He had a collected canter that was just the most unbelieveable feeling - he'd rock back on his massive hindquarters and it was like riding a rocking horse - he could make anyone look good in his canter. As a youngster we called him hammer head - he was so heavy in the bridle - he'd curl his neck and try to get you to hold up his head for him. He wasn't an easy horse to ride but he was always fun. Imported from Germany as a jumper prospect Barry's timidness and spooky nature prevented his jumper career from ever getting off the ground. I remember jumping him as a youngster and he crashed a 18" set of crossrails - putting me firmly on the ground and shattering the jump bars as he fell through them. Oh, how we laughed at that moment - the klutz riding the klutz - falling over a couple of sticks. His hocks prevented him from doing too much jumping, but he always appreciated the break from real work. Barry was the first "competitive" horse I campaigned - we went all over New England - Barry and I. He had this easy-going presence but inside he was very meek - afraid of bushes that waved at him as he passed yet he learned to walk calmly and confidently through crowds while ATVs whizzed by us. 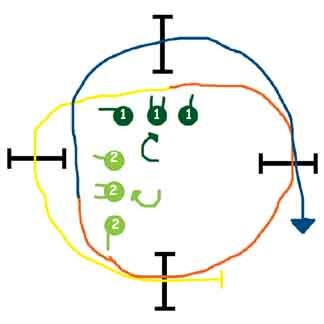 Barry had the ability to move laterally in his spook, you'd be walking along the trail on one line and for no particular reason in an instant you'd be 10 feet to the left on a new path but rarely unseated by this movement. Barry won more than his share of classes and together we won regional team championships three years in a row. As experienced as Barry got with all of his travel and going new places, every time he backed out of the trailer he'd prompty whack his head each and every time - THUNK. I remember only one time he stepped out of the trailer without whacking his head and when I remarked on the occaision he promptly stepped forward and threw his head up for another resounding THUNK. Barry wore two hats when he traveled just so he wouldn't crack his skull open. Barry was the Murphy of the horse-world. Passive, get along with everyone kinda horse, he started each and every day happy to have breakfast, happy to be turned out, happy to stay in his stall - whatever you threw at him was just OK with him - often the victim of bullies he rarely made it through an entire winter season with the same set of clothes he started out with. There were more than a few frigid January days where he was turned out naked all day because one of his friends had torn a hole in his blanket and it needed repair (or more often it was beyond repair and needed replacement). Barry never had an unkind word (or expression) for anyone - probably the only horse I've ever met who considered it below him to bite or kick - even if we were doing something awful to him (medically of course) - I don't think he ever even pinned an ear back. Barry worked as a school horse occaisionally for the UVM equestrian team and he was always used in the inter-collegiate shows UVM hosted - everyone wanted to draw his name because he was not only gorgeous to look at, he could make any equitation rider look good - more often than not his rider would win the class over better riders on other horses. Barry was sold a few years ago to a woman in Mass who wanted a horse to learn the upper level movements from. I take a great deal of comfort in the fact that he was as spoiled with her as he was with me - probably more so. Barry was happy, healthy and working several days a week until Monday - when he told everyone it was his time to go. I heard that the woman's daughter finally was allowed to ride Barry all by herself a couple of weeks ago. I suspect Barry's misson on this earth was complete.